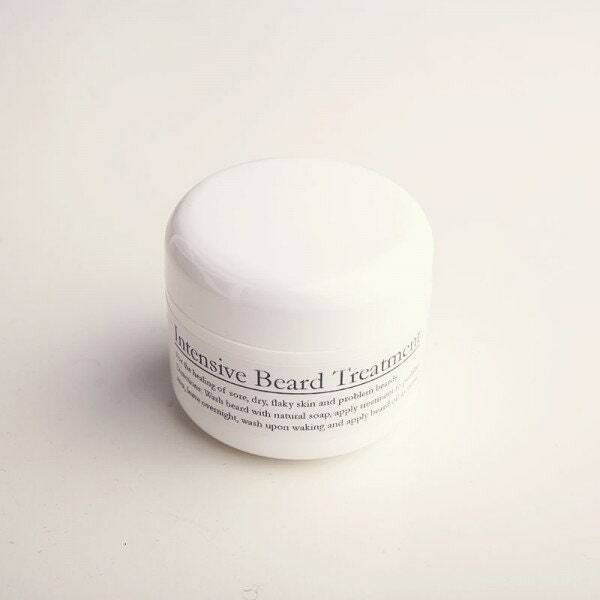 Intensive Beard Treatment For the healing of sore, dry, flaky skin and problem beard areas. Also a great moisturiser for men. Our incredible healing beard treatment. Can be used to repair beard dysfunction: sore, dry patches, beards that are in poor condition, or just use to give your beard a weekly tonic (that's what we do). It nourishes and improves beard condition like nothing else. Made with beautiful, rich organic oils, (coconut, argan, grapeseed and olive oils), coca butter and beeswax, scented with bay laurel and palmarosa and powered with witch hazel, this is the best care a beard can get. Directions: Wash beard with natural soap, apply treatment and leave overnight. Wash out with a little natural soap in the morning and apply beard oil as usual. Pro tip: since the treatment is so good for your skin, it can be used as a moisturiser too.